I have to admit that I really only became a real ramen fan after watching Tampopo, one of the best and funniest food movies ever made. For those few of you who haven’t seen this delicious and delightful film, boy are you in for a treat! I’ll try not to spoil too much of it, but essentially, Tampopo is a self-titled “spaghetti Western” (yah, I know, bad pun) that centers around a female ramen stall owner whose ramen are less than edible and a mysterious trucker and ramen connoisseur who teaches her how to make the perfect bowl of noodles. Watching Tampopo always makes me hungry. It especially makes me crave good ramen–ramen with delicious hot soup, light springy noodles, and tender fatty morsels of pork. Singapore has a Tampopo as well. But it’s hardly similar to the simple countryside ramen shop featured in Juzo Itami’s amazing film. Our Tampopo is in the basement of the Liang Court Shopping Centre (just a short walk from my office) and is tucked in the back of the Meidiya supermarket. Further, this rather non-descript restaurant is actually two restaurants in one. Sharing the same premises with Tampopo, which offers up noodles, sushi and other cooked foods, is Tomton, a katsu specialist. Tomton serves some of the best katsu in town. Its specialty, predictably, is a breaded and deep-fried cut of deliciously fatty pork loin. But at close to S$20 an order, it’s a little too pricey (plus a bit too unhealthy) for the average weekday lunch. What I do like to have, and have had over and over again, is Tampopo’s Kyushu Jangara Ramen, which costs only S$12.80. 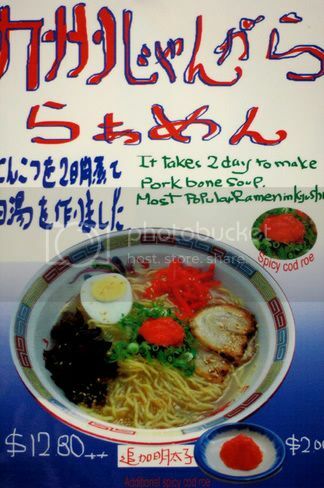 Until recently, the signs in Tampopo that advertised the Kyushu Jangara Ramen said that because the pork bone soup that it comes with took two days to make, only 22 bowls were available each day. The first time I tried to order it, it was sold out. Which, of course, only made me want to try it even more. When I finally did get around to trying it, I was thrilled. It was delicious. Tampopo’s Kyushu Jangara Ramen is essentially a tonkotsu ramen, the term “tonkotsu” meaning that the soup, as mentioned above, has been made from pork bones. This kind of ramen is typical of Kyushu, whereas, for example, miso ramen is more typical of Hokkaido. Ramen afficionados will contend that the test of a great ramen is the soup. 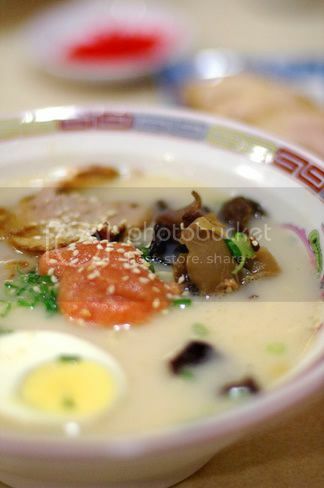 While the noodle itself and the other ingredients and toppings are important, without a great soup, the whole dish fails. The milky white soup that comes with the Kyushu Jangara Ramen is beautiful. It’s both rich and satisfying. This is further complemented by a large helping of mentaiko (spicy cod roe), which gives the soup a delightful spiciness. The noodles are good. They might not be springy enough for some Japanese friends of mine–who all seem to favor extremely springy noodles–but they’re good enough for me. The dish is further enhanced with two gorgeous pieces of roasted pork, a half of a hard-boiled egg, some woodear fungus and some freshly chopped spring onions. I recommend ordering an extra plate of pork; for S$3, you can enjoy 5 more slices. While I’ve been having this wonderful ramen dish for lunch sporadically over the past few months, S had never had it. So today, I invited her to join me. I’m happy to say that she enjoyed her bowl as much as I enjoyed mine. If you want more info on ramen, please check out this really great article. Aun, as usual, I’m ravenous after reading your latest post. I, too, only discovered ramen after seeing Tampopo. Recently, I finally found a decent ramen shop in San Francisco with a wonderful pork broth, but it just doesn’t sound quite as good as the one you describe. Thanks for the link to the thorough article, too. yup, the pork bone stock is really rich. first tried in tokyo (near shinbashi station) and i’m hooked. best of all it’s only 650yen with 5 or 6 slices of pork (2 yrs ago?) of coz no spicy cod roe. this sounds worthy of trying. yum yum. thks! about the design of the bowl. the outward curve at the rim it designed for ease of slurping soup directly from the bowl. And those squarish pattern at the rim, i read it is for protecting one from evil spirits hehehe … not too sure how true. cheers! Wow that soup looks really thick and rich! I must try it the next time I’m in town. Tampopo is one of my favourite films of all time. I love the scene where the old man shows the correct way to eat, including reassuring the roast pork. And I too only recently discovered tonkotsu ramen. Your ramen photo is mesmerisingly good! always look forward to reading your blog and salivating over the food as i am doing now:P.
Anyway, do you know where to find a really really nice vegetarian restaurant in singapore or whether any recipe that you have personally try before? Looks delicious! I’m going to try it this weekend! Have you tried the one at Bongout – the japanese comic book cafe at Robertson Quay? I really like the ramen there, very solid broth and melt-in-the-mouth pork. Most of the other menu items are very good as well. I just had fast food ramen last night – MSG-city, ugh. it seems as though the river valley area is home to alot of great ramen places! my favourite is at riverside point–unfortunately i can’t remember the name of the restaurant, but it’s pretty easy to spot. the noodles and soup are great, the pork is really tender and the egg is wonderfully runny (well that works if you like runny eggs). and it’s $9.90! hmm, would you know their opening hours, by any chance? I have just recently picked up the love for ramen, having been in honolulu for work not too long ago. There were so many little ramen shops along Waikiki; I had ramen for dinner almost every night. It was just so tasty, and cheap too! I haven’t tried the ramen at Tampopo yet, but am determined to try after reading your scrumptious description. Have you tried the ramen at Gallery Hotel? That’s pretty good too. Brett: Thanks for the comments. I really like the article. Loads of info on different regional ramen…who knew there were so many kinds? tscd: Hope that next trip is sometime soon. Augustus: I love that scene also! The tapping of the bowl, the appreciating the soup, the placing of the pork to one side… it’s a fantastic part of a fantastic movie. Anonymous: Ling Zhi is pretty good. Not so much into vegetarian food. Original Sin is also vegetarian, but I find the food there amusingly unhealthy (ironic since it’s vegetarian eh?). I haven’t tried the ramen at Bongout. A Japanese friend of mine likes going there for the Japanese curry. I’ll have to trek over soon. Jelly Girl: Hawaii? I’m so jealous. Actually, that same Japanese friend who likes Bongout favors the Gallery hotel ramen place. It’s her favorite place in town. I liked it, but wasn’t blown away. What a wonderful write up! I’ll be adding it to my burgeoning list of items/places to eat when I’m in Singapore next month. Unfortunately, there is only one chain of Kyushu Jangara in Tokyo for me…..and at JPY 1,000 for the “Zenbu”, no other ramens can beat this…..heavenly. I have tried this dish twice, plus some of their other dishes. Not very fantastic, and not as good as what its claimed here. I wold rate it 5.5/10 only. Well, its my take. You all are free to try it.